From the moment I met Lorna Sass, I felt as if I was visiting with an old friend. Lorna’s pressure-cooker books are seminal, and I’d always been interested in what she wrote. As her recipe shows, risotto is one of the dishes that the pressure cooker does best. The cooker pulls the starch out of the grain in record time, so you need only stir for a few moments to finish off the dish rather than stand at the stove during the entire cooking time. Farro, a type of emmer wheat, is an ancient cousin of the wheat commonly grown in this country. The starch in farro creates a wonderfully creamy risotto. Italian farro is sold in most gourmet shops and is readily available by mail order. For this dish, you’ll need semipearled farro, labeled farro perlato._ If you don't have farro on hand, see the variation that uses rice, below. Using a mortar and pestle, crush the saffron threads and stir in the warm water. Alternatively, crush in a small bowl with a spoon. Set aside. In a 4-quart (or larger) pressure cooker over medium-high heat, warm the oil. Sauté the onions until they begin to soften, 2 to 3 minutes. Add the farro and stir to coat with the oil. Continue cooking and stirring until the farro releases a toasted aroma, about 2 minutes. Stir in the wine and cook until it evaporates. Stir in 3 cups of the broth, stirring to scrape up any browned bits sticking to the bottom of the cooker. Lock the lid in place. Bring to high pressure over high heat. Reduce the heat just enough to maintain high pressure and cook for 8 minutes. Turn off the heat. Quick-release the pressure according to the manufacturer's instructions. Remove the lid, tilting it away from you to allow steam to escape. Stir in the saffron. Set the cooker over medium-high heat and stir the farro vigorously. Boil uncovered, stirring every minute or so, until the mixture thickens and the farro is tender but still chewy, 1 to 3 minutes. If the mixture becomes dry before the farro is done, stir in ¼ to ½ cup of the remaining broth. The finished risotto should be slightly runny; it will continue to thicken as it sits on the plate. Stir in the scarlet runner beans and cook for 1 minute. Turn off the heat and stir in the ⅓ cup cheese, walnuts, and thyme. Add salt and pepper to taste. Serve in shallow bowls or on plates. Garnish each portion with additional cheese. 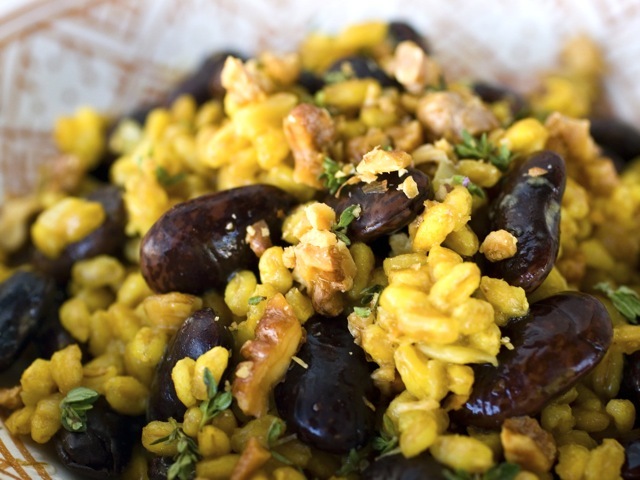 Substitute 1 1/2 cups Arborio or Carnaroli rice for the farro. Increase the broth to 3 1/2 to 4 cups. Decrease the cooking time under pressure to 4 minutes. You can use marrow beans if you like, but the color of the scarlet runners against the saffron is fabulous.